Most of the first black congregations and churches formed before 1800 were founded by free blacks – for example, in Philadelphia, Pennsylvania; Petersburg, Virginia; and Savannah, Georgia. The oldest black Baptist church in Kentucky, and third oldest in the United States, was founded about 1790 by the slave Peter Durrett. After slavery was abolished, segregationist attitudes in both the North and the South discouraged and even prevented African Americans from worshiping in the same churches as whites. Freed blacks most often established congregations and church facilities separate from their white neighbors, who were often their former masters. These new churches created communities and worship practices that were culturally distinct from other churches, including unique and empowering forms of Christianity that creolized African spiritual traditions. African-American churches have long been the centers of communities, serving as school sites in the early years after the Civil War, taking up social welfare functions, such as providing for the indigent, and going on to establish schools, orphanages and prison ministries. 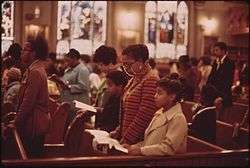 As a result, black churches have fostered strong community organizations and provided spiritual and political leadership, especially during the civil rights movement. "Wade in the water." 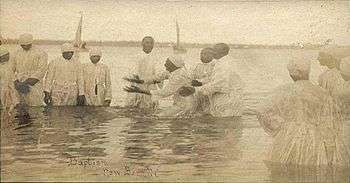 Postcard of a river baptism in New Bern, North Carolina, around 1900. In 1787 in Philadelphia, the black church was born out of protest and revolutionary reaction to racism. Resenting being relegated to a segregated gallery at St. George's Methodist Church, Methodist preachers Absalom Jones and Richard Allen, and other black members, left the church and formed the Free African Society. It was at first non-denominational and provided mutual aid to the free black community. Over time, Jones began to lead Episcopal services there. He finally led most of its members to create the African Church, in the Episcopal tradition. In the fall of 1792, several black leaders attending services at St. George's Methodist Church and had recently helped to expand the church. The black churchgoers were told to sit upstairs in the new gallery. When they mistakenly sat in an area not designated for blacks, they were forcibly removed from the seats they had helped build. According to Allen, "...we all went out of the church in one body, and they were no longer plagued by us". While he and Jones led different denominations, they continued to work closely together and with the black community in Philadelphia.... It was accepted as a parish and on July 17, 1794 became the African Episcopal Church of St. Thomas. In 1804 Jones was the first black priest ordained in the Episcopal Church. (Butler 2000, DuBois 1866). Richard Allen, a Methodist preacher, wanted to continue with the Methodist tradition. He built a congregation and founded the Bethel African Methodist Episcopal Church (AME). By July 29, 1794, they also had a building ready for their worship. The church adopted the slogan: "To Seek for Ourselves." In recognition of his leadership and preaching, in 1799 Bishop Francis Asbury ordained Allen as a Methodist minister. Allen and the AME Church were active in antislavery campaigns, fought racism in the North, and promoted education, starting schools for black children. Finding that other black congregations in the region were also seeking independence from white control, in 1816 Allen organized a new denomination, the African Methodist Episcopal Church, the first fully independent black denomination. He was elected its first bishop in 1816. While he and Jones led different denominations, they continued to work closely together and with the black community in Philadelphia. Soon thereafter, Allen. Jones, and others began soliciting funds, again with the help of Rush. Their appeals met with resistance from white church leaders, many of whom had been supportive of the black community, but disapproved of a separate back church. After emancipation, Northern churches founded by free blacks, as well as those of predominantly white denominations, sent missions to the South to minister to newly freed slaves, including to teach them to read and write. For instance, Bishop Daniel Payne of the AME Church returned to Charleston, South Carolina in April 1865 with nine missionaries. He organized committees, associations and teachers to reach freedmen throughout the countryside. In the first year after the war, the African Methodist Episcopal (AME) Church gained 50,000 congregants. By the end of Reconstruction, AME congregations existed from Florida to Texas. Their missioners and preachers had brought more than 250,000 new adherents into the church. While it had a northern base, the church was heavily influenced by this growth in the South and incorporation of many members who had different practices and traditions. Similarly, within the first decade, the independent AME Zion church, founded in New York, also gained tens of thousands of Southern members. These two independent black denominations attracted the most new members in the South. Black churches held a leadership role in the American Civil Rights Movement. Their history as a centers of strength for the black community made them natural leaders in this moral struggle. In addition they had often served as links between the black and white worlds. 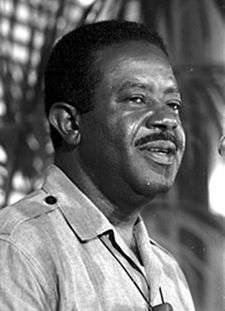 Notable minister-activists of the 1950s and 1960s included Martin Luther King, Jr., Ralph David Abernathy, Bernard Lee, Fred Shuttlesworth, Wyatt Tee Walker and C. T. Vivian. Although black urban neighborhoods in cities that have deindustrialized may have suffered from civic disinvestment, with lower quality schools, less effective policing and fire protection, there are institutions that help to improve the physical and social capital of black neighborhoods. In black neighborhoods the churches may be important sources of social cohesion. For some African Americans the kind of spirituality learned through these churches works as a protective factor against the corrosive forces of poverty and racism. Churches may also do work to improve the physical infrastructure of the neighborhood. Churches in Harlem have undertaken real estate ventures and renovated burnt-out and abandoned brownstones to create new housing for residents. Churches have fought for the right to operate their own schools in place of the often inadequate public schools found in many black neighborhoods. ↑ Sutton, Charyn D. (1992). Pass It On: Outreach to Minority Communities, Big Brothers/Big Sisters of America. 1 2 3 Maffly-Kipp, Laurie F. (May 2001). "The Church in the Southern Black Community". Retrieved 2007-05-21. 1 2 Robert Hamilton Bishop's An Outline of the history of the church in the state of Kentucky, during a period of forty years (containing the memoir of Rev. David Rice), T. T. Skillman, 1824, pp. 230–33. 1 2 Anne H. Pinn, Fortress Introduction to Black Church History, Minneapolis, Minnesota: Augsburg Fortress, 2002, p. 2. 1 2 3 Abdul Alkalimat and Associates. Religion and the Black Church. Introduction to Afro-American Studies (6th ed.). Chicago: Twenty-first Century Books and Publications. 1 2 "Africans in America: The Black Church". Retrieved 2007-05-21. ↑ Rimsa, Kelly. "The Underground Railroad in Indiana". Archived from the original on 2007-04-13. Retrieved 2007-05-21. ↑ Raboteau, Albert J. (2004). Slave Religion: The 'Invisible Institution' in the Antebellum South. Oxford University Press. pp. 139, 141. Retrieved 2008-12-27. ↑ "Daniel Payne", This Far by Faith, PBS, 2003, 13 January 2009. ↑ James T. Campbell, Songs of Zion: The African Methodist Church in the United States and South Africa, New York: Oxford University Press, 1995, p. 54. ↑ Peter Kolchin, American Slavery: 1619–1877, New York: Hill and Wang, 1994, p. 222. ↑ "We Shall Overcome: The Players". Retrieved 2007-05-29. ↑ "The Diminishing Divide ... American Churches, American Politics". June 25, 1996. Retrieved 2007-05-16. ↑ Fears, Darryl (2004-11-02). "Gay Blacks Feeling Strained Church Ties". Washington Post. Retrieved 2007-05-16. ↑ Jeffrey S. Siker, Homosexuality and Religion: An Encyclopedia, 2007, p. 49. ↑ "Changing Attitudes on Gay Marriage". 29 July 2015. Retrieved 4 November 2015. ↑ Hahn, Heather. "Gay pastor's removal brings sadness, defiance". www.umc.org. United Methodist Church. Retrieved November 26, 2015. ↑ Barbara Bradley Hagerty, "A Closer Look at Black Liberation Theology", National Public Radio. ↑ Cornel West and Eddie S. Glaude, eds, African American Religious Thought: An Anthology, 2003 ISBN 0-664-22459-8, p. 850. ↑ Powell, Michael. "A Fiery Theology Under Fire", The New York Times, May 4, 2008. ↑ TUCC Talking points; see also [www.mcclatchydc.com/227/story/31079.html Margaret Talev, "Obama's church pushes controversial doctrines"], McClatchy Newspapers, March 20, 2008. ↑ Root shock: The consequences of African American dispossession, Journal of Urban Health. New York: Springer. Volume 78, Number 1 / March 2001. ↑ Douglas A. Smith, "The Neighborhood Context of Police Behavior", Crime and Justice, Vol. 8, Communities and Crime (1986), pp. 313-41. ↑ Mary Pattillo-McCoy, "Church Culture as a Strategy of Action in the Black Community", American Sociological Review, Vol. 63, No. 6 (December 1998), pp. 767-84. ↑ Bruce Makoto Arnold. "Shepherding a Flock of a Different Fleece: A Historical and Social Analysis of the Unique Attributes of the African American Pastoral Caregiver". academia.edu. ↑ Wendy L. Haight, "'Gathering the Spirit' at First Baptist Church: Spirituality as a Protective Factor in the Lives of African American Children", Social Work, Vol. 43, 1998. ↑ "Abyssinian Development Corporation". Abyssinian Development Corporation. ↑ Azi Paybarah, "A Harlem Church Sues to Operate Charter School Archived January 21, 2008, at the Wayback Machine. ", October 25, 2007. 1 2 Moore, John Jamison, D.D (1884). History of the A.M.E. Zion Church in America. Founded 1796, In the City of New York. York, Pa: Teachers' Journal Office. ↑ "History of the National Baptist Convention, USA, Inc.". Archived from the original on 2007-01-06. Retrieved 2007-05-29. ↑ "The Story of Our Church". Archived from the original on 2007-05-13. Retrieved 2007-05-22. ↑ "Chronology of Dr. Martin Luther King, Jr". Archived from the original on 2007-05-02. Retrieved 2007-05-22. ↑ "Largest Religious Groups in the USA". adherents.com.